After his second year of graduate school at Princeton, Richard Feynman faced his oral examinations. Feynman was not yet the famous physicist he would soon become (as his biographer James Gleick put it, “His Feynman aura…was still strictly local”), so he took his preparation seriously. Feynman drove up to MIT, a campus familiar from his undergraduate years, and a place “where he could be alone.” It’s what he did next that I find interesting. I might not have worked with any future Feynmans during my time at MIT, but I certainly had the privilege to watch the ascent of at least two or three future stars in the world of science. And one thing they all seemed to share with Feyman was his hunger to understand what he didn’t know. If someone published something good, they wanted to understand it. If this good thing used some mathematical technique they didn’t know, they’d drop off the radar until they learned it. If you published an interesting result, they’d soon learn every detail and be able to replicate it easier than you could manage. Their proverbial notebooks of things they don’t know where always growing, and as a result, they thrived. I think there’s a general method lurking here. People resist learning hard things — be it a graduate student mastering fundamental physics or an online marketer taming a new digital analytics tool — because learning is hard and requires significant amounts of deep work. Dedicating a notebook to a new learning task, however, can provide concrete cues that help you stick with this hard process. At first, the notebook pages are empty, but as they fill with careful notes, your knowledge also grows. The drive to fill more pages keeps your motivation stoked. It’s a simple idea: translate your growing knowledge of something hard into a concrete form and you’re more likely to keep investing the mental energy needed to keep learning. But sometimes a simple idea is all it takes to unlock a new level of potential. You should seek that same pride in your own quest to become too good to be ignored. Wonderful post Cal. This last year I have made it my mission to transfer my accounting & tax knowledge (I’m a CPA) into Microsoft Onenote. Then I am forcing myself to organize and review it – not just let it sit in a notebook. Like you say Cal, it is hard work; but it has been very helpful this last year on multiple occasions. Furthermore, I feel like I am actually progressing in knowledge and understanding. Great notes reviewed often are the key! Love this use of a notebook! Thanks for posting! I second this thought – I homeschool my kids, and I think this idea is translatable to kids as well – what a great habit it would be to keep a notebook on things you don’t know about, want to understand more, etc. Another method at work here is that of thinking on paper. That allows for a greater objectivity about what you know (or don’t know) and allows you to focus more intensely on whatever mental work needs to be done. I’m confused, as Gleick’s passage contains too much bla bla. For the first but not last time he reorganized his knowledge. What exactly was the method about? Keeping a list of topics that Feynman didn’t yet fully understand? And then work towards clearing the white spots on the map? Or was it “re-organizing knowledge”, writing down things he knew. Then why call the notebook “Things I don’t know about”? In any case, it seems like a good idea to keep a list of open questions on paper, rather than just thinking in the back of your head “I didn’t fully understand this” about a certain topic, and then work systematically towards clarification of the open questions. Sometimes, understanding what exactly you don’t understand can be tricky enough. 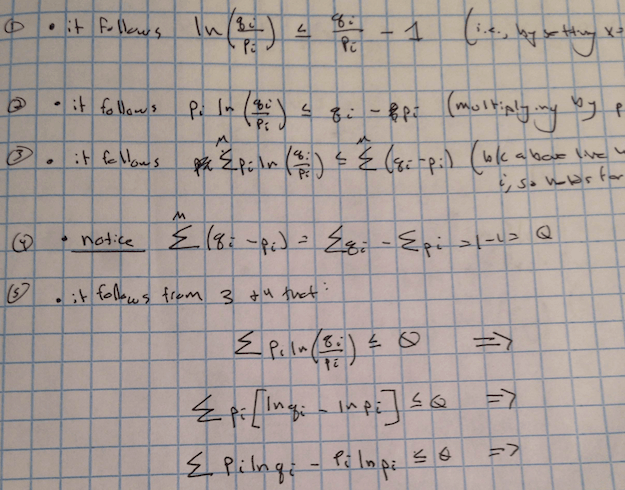 Keeping a written record of a mathematical derivation that was difficult – well duh. Scott Young calls this the Feynman Technique (http://www.google.com/search?q=feynman+technique). Here’s the main idea: if you try to explain a concept in very simple terms, like you’re teaching it to a beginner, you’ll force yourself to understand it from the ground up. It’s a way of identifying the gaps in your knowledge of a topic, and then filling them. This is exactly what I needed to read. Thanks! I find this information to be extremely helpful. Personally, during my own college career, I have had several topics that have been very difficult to correctly break down, analyze, and understand. To be honest, I follow human nature to exactness and have avoided difficult concepts like the plague. Obviously, it’s all come back to bite me and I need to make a change. THIS will be my change. There are other ways to force yourself to learn something hard. When I was studying engineering, I often used the questions in Schaum’s outlines to push me on. There are hundreds of those books, many with thousands of questions and linked to explanatory videos. No connection to the publisher. Just a satisfied user. There are hundreds (thousands?) of interesting papers with ideas and techniques I would love to learn. It would require, at least for me, deep work to understand them at a useful level of detail. So how does one manage the trade-off: Deep learning of potentially but not immediately useful ideas versus deep creativity directly associated with one’s goals? Neuroscience grad guy here: In my estimation, immersion always pays off and often in ways that you don’t think it will. Recently, I discovered that my understanding of the molecular intricacies of neuroscience left something to be desired and I’d resolved to make that part of my knowledge base deeper. While I haven’t used the notebook method (yet), I decided to read at least an hour a day of molecular fundamentals, monday through friday. It was just the basics, stuff I should’ve picked up in my undergrad. I’ve found just going back to all this stuff and really trying to engrain it into my mind has expanded my thinking about many related subjects like chemistry and biology, and how all of these interplay in the brain. Strange coincidence, I was a bit under confident when I entered into college. And before every exam I made a list of things I didn’t know. It worked wonders for me and is paying me compounded interest till today. People will pay money for what sort of advice? Keeping a notebook or working without distractions for periods of time, called ….deep work….?? Hahahahah. What a racket!! I agree with Ariel. I would love to understand a bit more how this is supposed to work. When I start the notebook, what would be an example first entry? What would I then do when I learn more about it? Cross it off the list? Update the page with information on what it is, proving I now know? Hey, Ariel. I will illustrate my understanding of the concept by trying to explain something I don’t know much about. When we eat food, it goes down out esophagus and sits in our stomach. There, stomach acid (which contains hydrochloric acid) starts to break down the food. The more surface area the food has, the easier it is to break down. That’s why chewing is important. In the stomach (or is it in the intestines?) there are varying amounts of enzymes, including protease (to break down protein) cellulase (to break down celluose) lactase (to break down lactose), and others. From the stomach, the partially digested food moves (how?) into the upper intestine, then into the lower intestine (how?). In the intestines, there are probiotics (one of which is lactobacillic acid), which help break down food even more (how?). At some point in this process, fats (lipids? peptides?) and carbohydrates are either used (how) or stored (how? In those spherical things). Unsaturated fats take up more volume because the carbon spine is bent because the hydrogen atoms are unevenly distributed. Saturated fats take up less room because they are straight (rigid. that’s why their texture is firm at room temperature) because the hydrogen atoms are evenly distributed and counterbalance each other. That’s why saturated fats pack more tightly into fat cells. And so on. By looking at the parts of my explanation where I have questions, or where my explanations get vague, I know what to investigate. Perfect! Now I get it. Thank you taking the time to write this post. Gleick explanation does not provide the ‘How’ of the Notebook process. You need to learn about Concept Mapping and Govin’s Vee Heuristic to learn the details. These two tools are covered in detail in the book: Learning How to Learn by Joesph D Novak. I am beginning high school but I have started learning Functions and I keep notes of the things I don’t know. As, I learn I write the kernels of that subject and continue on. It is a tremendous help and is a great method.It makes you learn and review. Hi, May you know where I can find an online copy of one the Feynman notebooks? Really nice content of your post. Keep writing! Pingback: Richard Feynman’s “Notebook Technique” Will Help You Learn Any Subject–at School, at Work, or in Life | ? Download punk music albums for free ! Too bad author never replied to any comments. I am also confused with what went into that book… What I could make out of Gleick’s explanation is that Feynman considered all the Physics he knew and understood, and when he found some elements that he wasn’t so sure about he put them in that notebook. …yes, but the very next sentence in that bio reads “It was not much use in preparing for the examination, as it turned out.” (https://books.google.com/books?id=IWQ_y90P2uIC&pg=PA130). I would do this online so you could hyperlink points. Use a speech to text software to capture your thoughts then drill into them clean-them up.